BOSTON, January 5, 2011 – Public address systems routinely serve as a platform for live event venues, theme parks and other facilities to project voice and music, for everything from live paging and informational announcements to background music and concert performances. Most pre-recorded PA system announcements and musical soundtracks require substantial manual operation to ensure successful playout from source equipment. In 2008, Technomad introduced the Schedulon mp3 playback and recording system to give PA system operators the freedom of scheduling automatic playback of audio files down to the minute while maintaining a high level of manual control. In February, Technomad will introduce Schedulon v3.0 at the ISE show in Amsterdam (February 1-3, RAI Exhibition Centre, Booth 2A57), delivering new features and enhancements that build upon its previous successes. 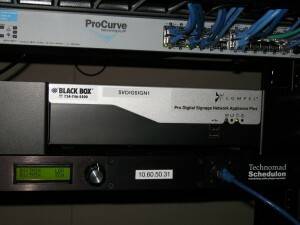 Closeup of a rack-mounted Schedulon installation at Simi Valley Hospital in California, where the unit is used for automatic playback of general announcements and music. Schedulon 3.0 retains the flexible options for instant, manual playback of user-loaded audio from a front-panel screen and push-button knob, while improving the automatic playback functionality through down-to-the-second scheduling. This gives operators the flexibility to create tighter user-defined playback schedules based on an internal clock or synchronized network time server. A nearly 200 percent increase in data transfer speeds vastly improves file upload times — especially ideal for operators recording field audio or uploading new announcements and musical files for near-immediate playback. An updated, more intuitive user interface enhances schedule building and creation as well as remote content management. In addition to mp3 file support, Schedulon v3.0 is the first version able to record and play back WAV format audio. The unit’s internal 2GB of storage can easily be expanded via low-cost, non-proprietary storage mediums, including USB sticks. Schedulon also improves user-protection and operator-access features through multiple password levels for administrators and general system operators. This is especially ideal for off-site operators uploading new files and creating schedules from remote locations. Features retained from previous Schedulon versions include an internal power backup option that provides up to 20 minutes of battery-powered operation. The battery also keeps any scheduled playback events on target for approximately 75 minutes. The Schedulon immediately ‘wakes up’ at the current time to resume playback of all scheduled content after battery power expires and the unit is restarted. The Schedulon can function as the audio source for a single PA system (in the same way a CD player or iPod can), or it can be used to feed audio to large scale paging / BGM systems in airports or retail spaces. Scheduling can be as straightforward or complex as desired, down to the exact time of day. All recording, uploading and scheduling tasks can be achieved without the need for a computer or web browser to minimize the risk of crashes and viruses.